That is so darling. I love your style. 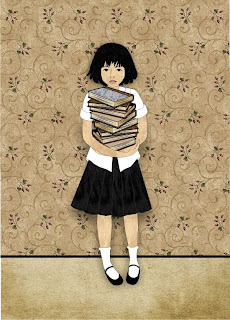 Poor honey, her eyes seem to be giving away that the books aren't quite the only burden tugging at her. what a darling illo! great colors and textures! ooh, so nicely done. Love the colors as well. wow - you have such a clean crisp style yet your illustrations are so warm! very impressive! Beautiful. Very nice work Ursula! Your work has such an interesting quality to it. Ohh.. i love your style. :D I like the background. Its nice. I love the colors too as well as the girl. Looks like she has some heavy reading to do! Lovely textures. very nice style and concept! I see so many kids today hunched over, barely able to carry such heavy bookbags. I like the warm tones in your work. This is a great scene, really well composed and very apt for the theme. This is beautiful, I love your colours!! that is sooo lovely---probably my favorite so far from your works! i love the vintage feel. Ursala, this is beautifully done!! !